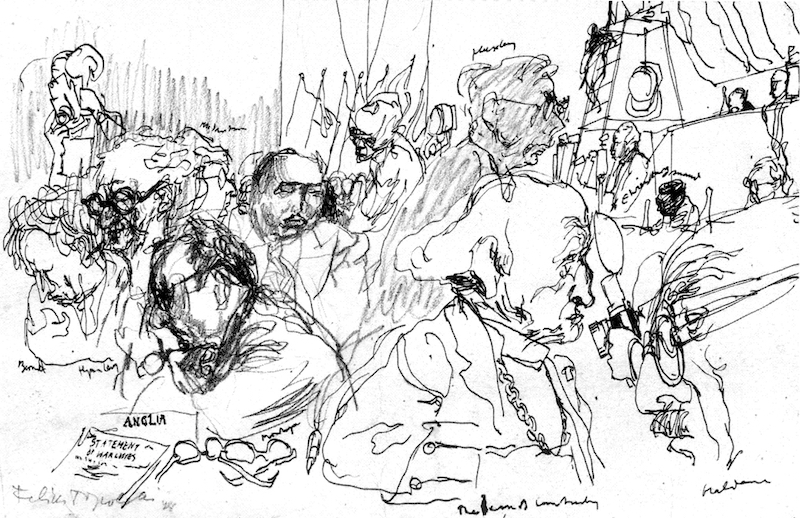 From Felix Topolski's Conference Sketchbook: International Congress of Intellectuals for Peace (Wroctaw, Poland, 1948). Left to right: J.D. Bernal, Hyman Levy, Ivor Montagu, Hewlett Johnson (behind him, Julian Huxley), J.B.S. Haldane. First published by Verso in 1999, J.D. Bernal: A Life in Science and Politics, edited by Francis Aprahamian and Brenda Swann, brings together 13 essays that survey the life and work of the pioneering Marxist molecular biologist and crystallographer. In the article below, Hilary Rose and Steven Rose trace the arc of Bernal's career. Francis Aprahamian, who worked with Desmond Bernal for many years, closely overseeing the editing of much of his later writing, including the final editions of Science in History, once described to us Bernal's characteristically innovative plan for a biography. 1 It was to be written in three parts and in three colours: red for his politics, blue for his science, and purple for his sexual life. That life in three colours was never written, and the biography by Maurice Goldsmith published in 1976 was written without access to the archives or the cooperation of those close to him. 2 Thus although the biography touched on all three parts of his life it is less than adequately grounded. 3 Bernal and his literary executors — mainly, but not only, the women who were central in his life — ensured that much of the material relating to his personal life was to be held back from the archives for fifty years. Science and politics, as two overlapping, mutually reinforcing public discourses, were to constitute the archive, the private only to be marginally acknowledged through the ephemera and writings that recorded the cognitive and political development of the child, youth, and public man. Joseph Needham once described Bernal to us as an extraordinarily attractive person, observing, "Desmond was wonderfully..." then he paused, and smiled with pleasure as he found the word "... polyvalent." Some of the women among Bernal's contemporaries were well aware that these affairs had not infrequently cost the woman more than the man. Bernal held strongly (and conveniently, a subsequent generation would come to think) to a view of sexual liberation as a progressive ideology to be shared equally by men and women. In practical terms this meant multiple sexual partners and no possessiveness. He had, for example, one lover in the USA who was supposed to share in a passionate relationship as and when they could get together but not to mind the separations. Unfortunately for her she did mind, and it hurt. To be told this by another of Bernal's ex-lovers showed something of the complexity of such situations. Yet despite all this he inspired tremendous and enduring love from women and men alike. As a committed Communist, above all during the Cold War, he was also to inspire hatred — the price of the life of the public intellectual. Bernal's sexuality and its linkages with his Communism and his science is mostly a story of silences and tacit knowledges. But if we try to use the colour purple there are important clues concerning his understanding of both sexuality and science, in that his relationships to women scientists were privileged. They were almost entirely excluded from his heterosexual enthusiasm. 8 By contrast, left women were a particular focus of passion. This privileging of women scientists casts light on why, after her conflict with Maurice Wilkins at King's College, London, the X-ray crystallographer Rosalind Franklin, whose pictures were stolen to provide the crucial clue as to the helical structure of DNA, went to Bernal's laboratory at Birkbeck. We know, from the account by Franklin's close friend and biographer Anne Sayre, that his lab was indeed a refuge. 9 In this laboratory, to be a woman scientist was to enter in an honorary capacity the brotherhood of men and thus to be (almost) above heterosexual invitation. As many women who have worked in almost entirely male enclaves know, becoming this kind of honorary man is one strategy to desexualize the environment and make work relations manageable. 10 The sexual self is denied and the woman scientist is that much less a whole person, but at least it is no longer quite so easy to have one's creative work appropriated, as the King's lab culture had tolerated, or to be offensively written off as sexually unattractive as in James Watson's story of the double helix. Bernal's ideology of sexual freedom, however challenging to the ideology of bourgeois monogamy, was none the less unthreatening to the accepted construction of scientists' masculine heterosexuality. Even at Cambridge, where a certain toleration extended to the homosexuality of arts dons (and even economists), it seemed that for natural scientists heterosexuality ruled. It was not that natural scientists were or are seen as glamorous, sexually desirable figures; they had, however dully and conventionally, to be real men. 11 Those who were caught transgressing this rigid construction of an acceptable sexuality came under intense social pressure; the highly publicized suicide in 1954 of the brilliant mathematician and code cracker Alan Turing, arrested for Cottaging, speaks of the price gay men scientists paid. Perhaps today it would be at last possible to be able to reflect on the silences and to write a critical biography of Bernal, from his belief in human liberation through class struggle, in abundance and peace through science, and in personal happiness through sexual freedom, through to the accommodations made with both Stalinism and the Cold War. Today, sixty years after the high optimism of The Social Function of Science, when whatever was both good and bad about the dream of a Communist utopia, or even "actually existing socialism," has been at least temporarily lost, and when feminism has taught us something of the complexity and pain of gender relations and their implications for the production of knowledge, we could in principle begin to talk seriously about a life in three colours. Here however our focus is on two, and on how during Bernal's lifetime the red faded down to pink with red patches, and the science went from blue to red and then to unequivocal blue — but harnessed to red goals. We explore Bernal's contribution to the politicization of science and scientists, above all the development of the Social Relations of Science movement. Inevitably there is a periodicity to Bernal's activities, with his early social concerns in the 1920s, the distress of the Depression, the evident threat of Nazism and Fascism, and his unequivocal political engagement during the 1930s forming one distinct arc, and the greatly changed political situation after World War Two another. The earlier period was an immensely productive one for Bernal. In his laboratories, first in Cambridge then at Birkbeck, he was laying the foundations of Crystallography and the work that would make the new molecular biology possible. 12 He was preoccupied with the struggles to build the Association of Scientific Workers as an effective trade union, and more generally against the Nazism and Fascism that were appearing within science as elsewhere. Bernal loathed their obscurantism and volkish mysticism: these were the enemies of reason. 13 His science and his politics were integral to his Enlightenment universalism. Science served Marxism, and Marxism served humanity, justice and freedom. It was for a later generation to learn painfully that this "universalism" had served men more than women and the interests of white people rather than black. This is not to diminish the historic role of the left's ideological struggle against Fascism and Nazism; rather it is to locate it in context and, above all, to understand the very different ideological positioning of science. With the post-1945 Cold War came Stalin's "two camps" view of the world and the Lysenko affair, with its especial challenge for the Social Relations of Science Movement. By the 1950s there was, on the one hand, an increasing acceptance by political orthodoxy, especially within the Labour Party, of a Bernalist view of the social functions of science, but with the class politics replaced by a nation-state corporatism. As depoliticized techno-economism, this revisionist Bernalism became the powerful orthodoxy of both national and international science policy, above all through that influential rich nations' club the Organization for Economic Cooperation and Development (OECD). 23 Meanwhile in the difficult context of the Cold War, Bernal turned his energies towards building internationalism through the peace movement. His writing, moving from his contribution to Britain without Capitalists (1936) to World without War (1958) is expressive of the change in direction. Bernal's optimism and enthusiasm — essential ingredients of any successful revolutionary change — stem in part from a powerful positivistic tradition in early-twentieth-century English socialism, a tradition common, for example, to G.B. Shaw, H.G. Wells, and the Webbs. Recruiting Bacon, both Queen Elizabeth's Lord Chancellor and modern science's founding father, into this left tradition was an extraordinary example of Bernal's capacity for creative synthesis. Like his socialist peers, Bernal shared a belief in the importance of intellectuals, the need for men (and rather rarely women) of exceptional talent to bring their services to bear on the making of a beautiful world. The relationship to the Shaw of Back to Methuselah and the struggle to overcome death through a disembodied intelligence or world brain is there in The World, the Flesh and the Devil; and it is present in the 1960s when he writes, more poignantly now, of the struggle against debility and death. 25 With Wells, he saw the scientists and engineers as having the "future in their bones" (to use C.P. Snow's often-quoted phrase); they were to be amongst the leaders, the planners, the theoreticians. As Benjamin Farrington has remarked, Bernal's strengths were not those of the philosopher; his Marxism was almost an extension of his natural science. For him science and Marxism formed the ultimate happy marriage. Yet it was precisely this which was Bernal's strength; the strength of a positivist tradition taken and made over, simultaneously claiming not only historical but dialectical materialism, in the interests of working people and of socialism. And, above all, the understanding that making a revolution was not merely a business of getting one's theory right, or influencing the "2000 who really mattered" in the elitist Fabian conception, but of practice, of struggle at all levels, in the streets and factories as well as the laboratories and committees. It is this personal commitment to public political action that must weaken the conspiratorial view, constructed by Werskey, 27 of Bernal as merely a Communist Party tool for winning over the intellectuals. Bernal's emergence as one of the central figures among the left scientists of the 1930s must be seen in the context both of his own development over the period and of the general political and social situation. The global background is well known: the economic depression and massive unemployment in all the capitalist countries; the emergence of Nazism in Germany and fascism in Britain, and the then apparently clearly shining beacon that the Soviet Union represented. In this context, and with the most recent of a long line of capitulations of the Labour Party leadership — that of Ramsay MacDonald — there for all to see, there was only one place for socially aware intellectuals as well as workers to be, and that was the Communist Party. Bernal himself saw this plainly. He had joined the Communist Party in the 1920s. A long draft of an unpublished article written in 1931, "What Is an Intellectual?" — a modified version of which was published in Cambridge Left in 1933 28 — argues that intellectuals must be politically engaged, that they cannot withdraw into their laboratories or studios or into the fragmentation of bourgeois life. (Oddly, in the light of their later roles, he lists Einstein and Picasso amongst the retreatist intellectuals — but then his relationship to Einstein, even when writing an obituary, was always somewhat ambivalent. The relationship to Picasso, not least through the peace movement, was to become more cordial.) An intellectual must mix as a citizen in the life of the time. Intellectuals who oppose fascism must ally themselves with the working class and support the Communists as offering the only possible alternative. And many, of course, did. As Perry Anderson points out, for some of the artists and literary figures it was to prove a transient, romantic attachment — an attachment that admittedly led many to their deaths in Spain. 30 But Anderson, in his splenetic dismissal of Bernal, fails to recognize that for many of the British left scientists the commitment was to last much longer, even if their socialism was to become translated into more uncritical enthusiasm for the Soviet Union. Why? Perhaps Farrington is right and "scientific socialism" spoke particularly to them; perhaps the influence of the leading figures was more powerful. But also, socialism and Communism seemed to offer something concrete to scientists that it could not so straightforwardly provide for other intellectuals. The enormous growth of and respect for science in the Soviet Union, its full incorporation into the political structure of the state, enthusiastically proclaimed by Bernal in article after article throughout the 1930s (and of course, long beyond), seemed to be a glimpse of the possibility of a promised land. For the situation of science in Britain was truly impoverished. Jobs were scarce and poorly paid (£150-£450 a year for a researcher or lecturer) at least until the professorial level (£1,000 to £2,000 a year). Research funds were scarce in universities, almost nonexistent in industry. In both industry and government, the isolation of the researchers from their academic counterparts guaranteed their mediocrity. In the aftermath of the 1914-18 war and the Haldane Machinery of Government Report of 1916, the state had begun to support basic science by way of the research councils, and industrial science by way of the research associations. But the funding was reluctant and, during the 1930s and the Depression, almost stagnant. Even by 1936, when Bernal was to make the first detailed estimates of science spending, he calculated it at no more than 0.1 per cent of GNP — compared with 0.6 per cent in the USA and more in the USSR. In a nonscientific society, science education was correspondingly poor, with anachronistic syllabuses (Bernal pointed out that science syllabuses in schools mainly concentrated on work that had been done prior to 1810, with a brief excursion in chemistry towards the 1890s), and, with the exception of biology (then usually called "nature study"), was virtually nonexistent for girls. It was against this background that critical voices in science had begun to be heard from the 1914-18 war on, demanding the professional recognition of scientists. Hence the emergence, in 1917, of the National Union of Scientific Workers (which, to help recruitment, changed its name in 1927 to the Association of Scientific Workers (AScW)) with both the professional and critical concerns firmly at its masthead. Membership was always small — mostly less than 1,000 — and fluctuated with its relative success or lack of success in local industrial negotiations, but it provided a focus for the activity of the left scientists. 31 Bernal himself was active in the AScW throughout the 1930s, and by 1938-39 was chairman of the union executive. From 1934, Bernal was actively involved with the Cambridge Scientists' Anti-War Group (CSAWG). Initially concerned with protesting publicly about the "prostitution of science for war purposes," the group went on to mobilize, organizing marches, pickets of military bases and petitions. As the military situation became more threatening, the group became more directly concerned with the consequences of war for the civilian population in Britain, and, in particular, the question of defence against air attacks. The group employed a combination of direct scientific experimentation — documenting, for example, the inadequacies of the government's advice on protection against gas attack and of the gas masks provided — with publicity by way of pamphlets, Left Book Club books, 34 and a campaign of public meetings across Britain which again involved many of the central figures among the left scientists. This campaign, too, began to involve the development of the subsequent generation amongst the left scientists: Eric Burhop, Dorothy Hodgkin, and Maurice Wilkins 35 amongst others have described their mobilization through the CSAWG. These concerns, then, the organization of scientists into the AScW, the raising of their political consciousness particularly regarding fascism and the danger of war, and work in the peace movement, formed the major elements of Bernal's political practice over the decade. But his outstanding achievement during the thirties was theoretical: the summary statement of the problematic state of science under capitalism and a prophetic attempt to describe the goals of a science under socialism, represented, in its final form, by The Social Function of Science. The Social Function of Science seems to have taken the best part of the decade of the thirties to mature. Bernal wrote several shorter versions of its main themes early on. Some of the ground is covered in a manuscript book synopsis entitled "The Scientist in the Contemporary World" (1934) (of which only four chapters were written) and Bernal's contribution to Britain without Capitalists, 36 a tour de force written by an "anonymous" collective of economists, scientists, and technicians. Bernal was the main author of a chapter entitled "Science and Education," which rehearses many of the main themes of The Social Function of Science. In some ways the optimistic belief in the imminence of revolution that the collective work expresses permeates Bernal's chapter and makes it more direct and explicit than his later book. It is not usual to think of science as an industry, the chapter unequivocally proclaims before going on to show that it is such, although "unlike other industries that are concerned in keeping a certain state of production going, science is concerned in changing that state" (p. 407). Later the chapter goes on to consider the potential effects of a socialist revolution in Britain on science. Bernal observes that some scientists, of course, will oppose it, but they are likely to be the older ones with little further contribution to make; some may get killed in a civil war. There will, however, be a tremendous pool of talent and most will go along with the revolution either out of conviction or because they are cramped under the present system. The revolution offers scientists the possibility of working under more attractive conditions because of the expansion of science that will come about as a result of it. There were two major additional theoretical inputs into the thinking of the left scientists during the 1930s. The first was the new perspective on the theory of the growth of science introduced to Western scholars at the International Congress on the History of Science and Technology in 1931. The Soviet Union sent a major delegation headed by Bukharin, and including the physicist Hessen. Hessen's path-breaking paper on the "Social and Economic Roots of Newton's Principia" 37 made a profound impact on the left scientists attending the meeting. 38 Bernal was at the conference, and acted as Bukharin's London guide during the meeting. Bernal's subsequent writing on science was to show the influence of both Bukharin and Hessen. Hessen's method of relating scientific development to the economic and social order and the demands of the rising bourgeoisie shaped Bernal's later writings. Subsequently Bukharin was to become one of the leading Communists to be tried and executed in the purges, and as a nonperson his ideas could not be directly discussed. Bernal's high prestige within the Soviet Union meant that Buhkarinist theories could be explored indirectly through Bernal's writing but, despite the evident indebtedness of the author of The Social Function of Science to Bukharin, there is no public record of Bernal defending him. These theoretical inputs of Hessen’s economic determinants of science and of dialectics of nature, together with the practical experiences gained through the political organizing of the 1930s, crystallized the earlier drafts into The Social Function of Science. Chris Freeman's chapter in this volume discusses the impact of this book in "science policy" terms. Here we want only to point to some of the essential political issues it raises. Bernal emphasizes the critique of science, its consequences in unemployment caused by new technology, in weaponry, in the sense of loss of individual security. Faced with these threats from science, there has been a revolt from reason, a retreat into irrationality and idealism of which fascism is the extreme case. Yet this idealism is no substitute for the creative use of science; science is power, the scientists as workers must use it in the interests of humanity. Bernal's emphasis on technological unemployment foreshadowed the dramatic restructuring of capital and production in the eighties. The parallels should not be pushed too far. Largely missing from Bernal's account are today's knowledge of the threats of a science that generates industrial pollution, health hazards, nuclear, chemical, and biological weaponry. His enemy was too little science; we and our environment all too often suffer from too much capitalist science. His optimism at the inevitably happy marriage of science and socialism led him to be silent on the ideological role of science, to say nothing of the problems of ideology in science. These silences are no more than the constraints of context: what is impressive is how often he moves beyond them. The first section of The Social Function of Science is a pioneering attempt to describe the existing state and frustrations of science in Britain and throughout the developed world. 43 It was this strand within the book that was to provide the basis for the techno-economist interpretation of Bernal in the 1950s and 1960s. It is, therefore, important to recognize that Bernal (like Marx) could — and indeed did — say, "I am no Bernalist." None the less, the critique of the inefficiencies of capital's use of science and the need to rationalize it, to plan, was shared by many sections of advanced capital, if not in Britain then certainly in Germany and the United States. David Noble, in his book America by Design, 45 time and again quotes passages from leading industrialists in the United States in the 1920s and 1930s urging scientific reform that could have come straight out of The Social Function of Science. The rest of the book is a more euphoric account of what science could achieve for humanity once the shackles of capitalism had been thrown off, a return to the straightforward optimism of The World, the Flesh and the Devil and indeed the theme that was to be reiterated again and again, ultimately in World without War. It concludes with the claim that science is Communism, Communism is science. But where Marx's science was "proletarian science," Bernal's science had unequivocal roots in natural rather than social philosophy. If in this chapter we wish to rescue the liberatory dimension of Bernal's agenda, we do so conscious always of the shadow of that other that prioritized the happy marriage of natural science and Communism. But the debate had a deeper political agenda, an agenda that resulted in Baker, the philosopher of science Michael Polanyi, and the botanist A. J. Tansley establishing a small and brief-lived Society for Freedom in Science, which in the aftermath of the 1939-45 war seized on the Lysenko question as precisely exemplifying its fears, and issued a series of pamphlets exposing the consequences of Stalinism for Soviet science. The society seems never to have been much more than a paper organization, and there were tensions between those high liberals for whom even to sign a manifesto was in contradiction with their belief in freedom, and those for whom the cloak of liberalism hid other Cold War goals. 49 Despite its continued existence throughout the war, the reality of the transformation of the British science scene after 1939 made the Society for Freedom in Science irrelevant. Bernal's immense activity in the 1939-45 war is discussed by Ritchie Calder in Chapter 7. The mobilization of the scientists in Britain is a story that has been told many times. 50 As "boffins" they worked on schemes ranging from civil defence to the treatment of wounds, the atomic bomb, radar, the Mulberry harbour, and a vast project to tow icebergs south to act as aircraft carriers — we do not propose to discuss them here. The scientific mobilization of the war effort rendered many of the themes of the frustration of science raised in The Social Function of Science temporarily irrelevant. By the time the war ended, the tenfold increase in science spending that Bernal had called for in 1939 had been achieved; science was on the political agenda as never before, and the time should have been right to move both the theoretical analysis and political struggles to a higher level. What happened, as we know, was rather different. To understand the fate of the left scientists' movement in the postwar world we have to recognize the changed historical context which suddenly denied space for left politics. Whereas in 1945 it had seemed that a significant move to the left was about to take place and that social justice was about to break out in the wake of the suffering of the war, international capital, spearheaded by the US, had no intention of simply letting go. A combination of military repression (Greece), financial inducements (the Marshall Plan), and political manipulation (France), to say nothing of the Soviet army's role in the conversion to Communism of Eastern European countries, led inexorably to the Iron Curtain. The result was that the world was split into what Stalin was to call the "two camps." For left scientists the two camps meant that political space was denied to them. Section X of the British Association, which in a less ideologically split world had provided an arena for left/liberal discussion, became closed to the Marxists. Liberal scientists who had hitherto quite often worked with the left, such as Julian Huxley, were no longer willing to work with Communist scientists. Bernal himself was excluded from the Council of the BA following reports of a speech he made in Moscow attacking the nature and control of science in the Capitalist West. In the Cold War it was no longer possible to be a (public) revolutionary 51 and keep a toehold in the British establishment. To get indignant about the exclusion of Bernal from positions of power in postwar Britain would be not to take seriously what he was saying and to fail to recognize the anti-Communist hysteria of the first Labour government. 52 The options for left scientists in Britain in the late forties were cooption or isolation. Despite the potentiality of people to make history, they do so, as Marx reminds us, in circumstances not of their own choosing. And the circumstances of the Cold War were indeed singularly unpropitious for the optimism of the thirties scientists. For Marxist scientists, and particularly Marxist biologists, the crisis that engulfed the world Communist movement in 1956 with Khrushchev's denunciation of Stalin had a serious fore taste in the Lysenko affair. Culminating in 1948 with the publication of Lysenko's triumphalist Soviet Biology, 53 it had a long history, beginning in the 1930s when Trofim Lysenko, a plant breeder of peasant origin, began to challenge the theories and findings of conventional genetics and especially the new plant genetics which was strongly represented in the Soviet Union by Nicolai Vavilov. The crisis in genetics was part of a general assault in the Soviet Union on the claims for the universality of science. Hessen's theoretical case for the possibility of two sciences, bourgeois and proletarian, found its first concrete embodiment: Vavilov's bourgeois science was to be replaced by Lysenko's proletarian science. Lysenko claimed that Vavilov's genetics, despite — or rather because of — their world (that is, bourgeois) fame were in actuality merely a combination of the idealist formulations of Mendel, Morgan, and Weismann. As such they were self-evidently reactionary, anti-Darwinist, and antisocial. The thrust of Lysenko's argument was that one philosophy in science and another in politics is a priori a lie. In part what Lysenko was doing has to be seen as an aspect of the questioning of authority and the attempts to build a socialist science and overcome bourgeois ideology that the late 1920s and early 1930s movement had opened up in the Soviet Union — an incipient cultural revolution. 54 Whatever the revolutionary intent, however, Lysenko's administrative and political methods of winning the debate, and indeed his "science" itself were both disastrously awry. Lysenko's challenge to the confused and often mystical underpinnings of much contemporary genetics could not be dismissed, but his own claims were based on singularly slender and even forged evidence (although, as Levins and Lewontin point out, 55 they were based on a practical appreciation of the irrelevance of the contemporary statistical procedures in genetics in the climatic conditions of the USSR). Lysenko's claims were initially treated with scepticism by both Marxist and non-Marxist biologists inside 56 and outside 57 the Soviet Union. However, this scientific and ideological debate was set in the specific context of Stalinism and the crude "partisanship" thesis of Zhdanov. Vavilov, along with so many other professionals and workers loyal to the hopes of a socialist society, was dismissed from his post and arrested; he was eventually to die in transit to a labour camp in 1943. Despite the dangers, Lysenko's position was none the less systematically criticized within the Soviet Union by both geneticists and philosophers of science right up to 1948. It was then, at the height of Zhdanovism, that there took place the crucial meeting of the All-Union Lenin Academy of Agricultural Science. Lysenko, despite the inadequacy of his scientific position, crushed all opposition by revealing that Stalin had administratively ruled in favour of "proletarian science" and was backing him. Soviet geneticists, faced with the administrative decision, enforced by terror, that genes have no material existence, found themselves committed either to acquiescence or to persecution. Several sought shelter within nuclear physics departments, as radiation biologists. All were denied the conceptual apparatus of genetics which was to lead in the West within the next five years to the Crick and Watson era of molecular biology. As we know, the Communist Party of Great Britain, along with other Western Communist parties, was, in the context of the Two Camps thesis, to rule that there were only two possible positions: either support for or hostility towards socialism, and thereby Lysenko. Debates within the Engels Society, the Marxist natural scientists' grouping within the CPGB, revealed a range of positions not so unlike those of their Soviet Counterparts. The crudest response was that of uncritical support for the Soviet Union, in which the task of CPGB was seen as "to study the conclusions of the leading communist authority in order to understand them." For Emile Burns, who had the task of summarizing the meetings, it was a simple matter of loyalty. "We meet here as communists. Hence we shall never tolerate any expressions hostile to the USSR. We regard the attitude to the USSR as fundamental to loyalty to the party and so to the working class." 58 The Communist geneticists, on the other hand, were disturbed by the lack of experimental details reported by Lysenko. Their responses ranged from a robust rebuttal of his claims to a more modest request for research papers that were longer than one or two pages. It was, however, the responses of the theoreticians Haldane, Levy, and Bernal that were most interesting and important. Levy's contribution thus sought to clarify the scientific and philosophical issues. Clearly endeavouring to find a synthetic and general solution he concluded that what was going on was something like the debate over field and particle in physical sciences, which he saw as a struggle against the permanence of artificial categories. These debates over Lysenko are not of mere historic interest; they go to the heart of contemporary biological theory, expressed in the conflict around the new molecular biology and genetic determinism. Just how far is DNA, as Watson claims, the "master molecule" and how far is it part of a biological process? To discuss them in detail would take us outside our brief here, but the questions that were then posed as the difference between mechanical and dialectical materialism are as vital today as they were in 1948. 63 The closure of the debate by administrative means and terror in the Soviet Union, and by Cold War mechanisms in the West, caused profound damage to Marxist thought about natural philosophy, a disaster so great that many would argue that the profound scar that it has inflicted on biological theory remains even today. Culturally and politically constrained in the British context, Bernal turned his attention to the building of international bridges and to circumventing the constraints and threats of the Cold War. His work in the AScW had already led to the foundation of the World Federation of Scientific Workers (WFSW) in 1946, in whose activities he became increasingly involved. The successor to the CSAWG was Science for Peace, founded in 1951, many of whose activists were in turn to become involved in the Campaign for Nuclear Disarmament in the mid-1950s. With the distancing from Stalinism following Khrushchev's speech in 1956, there was little energy to grapple with the theoretical issues of what a socialist science could be. Instead Bernal's response was essentially pragmatic, leaving the past to bury the past. From the 1950s on he never refers again to Lysenko except in the context of Science in History, 64 whose successive editions in the 1950s and 1960s gradually reduce the prominence given to Lysenko's claims. Bernal's uncritical eulogy of "Stalin the scientist," which appeared as his part of the Stalin obituaries of 1953 is the last reference to what he then described as "the greatest figure of contemporary history," who was "at the same time a great scientist," who "combined as no man had before his time a deep theoretical understanding with unfailing mastery of practice . . . his wonderful combination of a deeply scientific approach to all problems with his capacity for feeling and expressing himself in simple and direct human terms." 65 Of course Bernal should not have abdicated critical thought — any more than those of us who were subsequently to speak of the Chinese Cultural Revolution or the Vietnamese revolution in similar, if less grandiloquent terms, should have done. But if failing to appreciate at the time what was happening was understandable, failure to speak at all subsequently was not. Nor was it appropriate to talk, as Bernal did, about the post-1953 successes of molecular biology and the materiality of the gene as if they were ideology-free, without a backward glance at 1948. It is of course one of the ironies of the history of molecular biology that Bernal's scientific techniques, and indeed the pioneering research of his own laboratory, were centrally concerned with the elucidation of the structure of DNA, the very genetic material of which Lysenko had denied the existence. Bernal himself in 1968, reviewing the period and Watson's book The Double Helix, is mainly concerned to describe his own lab's involvement in the work and how they finally missed it. 66 He never took the opportunity to reflect on his own previous emphasis on process rather than permanence. The retreat from a socialist science into bourgeois neutrality meant that the ideological framework of the new molecular biology went unchallenged until the 1970s and the rise of the New Left radical science movement. Even without a cold war denying us intellectual and political space (although there has been a major ideological shift to the right from the 1980s onwards), the context of the current debate is difficult. The problems criticized are those of silence, a silence that meant that it was Bernal's legatee as president of the World Federation of Scientific Workers, the physicist and Lenin Prize winner Eric Burhop, who most prominently defended the position that "science is neutral" (that is, that there is only one modern science) within the radical science movement of the early 1970s. Back in the immediate post-war period of the late 1940s, however, the positivist strand of Bernal's pre-war writings was to remain and flourish whatever the theoretical and political difficulties his dialectical materialism encountered. He had revealed the inefficiencies of British science and had inspired a generation of younger scientists to think in the same vein. The war absorbed all their talents and by the end of it many had tasted the delights of power. Had a Tory government been returned immediately, many might have gone back into opposition, but Labour's mandate for change and its continuing belief in the need to reconstruct British science attracted many. At any rate, scientists touched by the Social Function of Science debate, like the physicist P. M. S. Blackett and especially Solly Zuckerman, moved closer to the state scientific advisory apparatus, carrying with them many of Bernal's views on how to organize science, but without his commitment to class politics — which meant that he himself was soon excluded. In Britain it was above all the Labour Party that was open to the technoeconomist argument. Over the twentieth century Labour has favoured industrial capital, unlike the Tories, who favour finance capital. The period of "thirteen wasted years" of Tory power between 1951 and 1964 briefly invested the techno-economic argument with some of the glamour of opposition. In Science and Society we have shown how techno-economism was adopted by Harold Wilson in the run-up to the 1964 election and given an almost messianic quality, of the building of socialism "in the white heat of the scientific and technological revolution." 71 Despite the hostility of the Labour Party to Communists, Bernal was too talented to ignore and he was involved in the key science policy discussions that the Labour Party held in the run-up to the 1959 and 1964 elections. The failure of the Wilsonian promise was also the failure of a revisionist Bernalism, a failure that no British government in the post-1964 period has been able to overcome. This cooption of Bernalism was not confined to the political sphere. The later 1950s and early 1960s saw the development of a sort of academic "Bernalism without Bernal," the growth of university and para-university units devoted to the agenda of The Social Function of Science, now variously named "Science of Science" or "Science Policy." Bernal had empirically demonstrated the "state of science" and this approach, suitably sanitized in the Cold War aftermath, was taken to the US by a Bernal disciple and historian of science, Derek de Solla Price. Price, using abstract numerical techniques alone, showed the irreversible transformation that had taken place as the production system of knowledge changed from little science to big science. 72 The philosophical origins of this brilliant analysis of the qualitative effect of the quantitative transition in the scale of science was never recognized in the US, where Price's work was acclaimed. Nearer home the period saw the growth of university science study units in Sussex (Chris Freeman), Edinburgh and Manchester, all of whose initial debts to Bernal were apparent. The independent Science of Science Foundation (later the Science Policy Foundation) was founded by Maurice Goldsmith, with a residue of Bernalian charisma. 73 Had Bernal died before the birth of the Radical Science movement in 1969, it would have been as if the revolutionary flames he had helped to light in the 1930s had burned down to a very dull ember. It was for a new generation to attempt to capture that spark and fan it to life. What should critical thinking about the sciences see as its legacy from Bernal? While Bernal confronted class antagonism in science, the analysis of the social relations of science has been extended over the last three decades to questions of ethnocentricity and androcentricity. Racist and patriarchal science, above all in sociobiology, has been interrogated and confronted. Yet although these dimensions of social relations were underrecognized in Bernal's time, it was he who gave us the essential concept of the social relations of science that allowed these questions to be raised. Nowhere in the corpus of Bernal's writings are these ideas expressed better than in his Marx and Science, a short pamphlet published in 1952: Farrington's introduction is brief: "I do not think Bernal has ever written better than here," he says, "and to those who know only the Bernal of The Social Function of Science it will prove a startling experience." In describing Marx's approach to science and dialectical materialism, Bernal opens many of the themes the later radical science, feminist, and environmental movements came to make their own. This chapter builds upon two earlier accounts: Hilary Rose and Steven Rose, "The Two Bernals: Revolutionary and Revisionist in Science," Fundamentia Scientia 2, 3/4, 1981; and Hilary Rose, "Talking About Science in Three Colours: Bernal and Gender Politics in the Social Studies of Science," Science Studies 1, 49-65, 1990. This latter paper was given at the Finnish Society for Science Studies 1989 meeting celebrating the 50th anniversary of the publication of The Social Function of Science. 1. John Desmond Bernal was variously called Bernal, J. D. B. and Desmond Bernal. Those intimates who knew him as a very young man were happy to call the young polymath Sage. 2. Maurice Goldsmith, Sage: A Life of J. D. Bernal, London, 1976. For his science see Dorothy Crowfoot Hodgkin, John Desmond Bernal 1901-71, Biographical Memoirs of Fellows of the Royal Society of London, Vol. 26, London, 1980; see also the Finnish journal Science Studies special issue celebrating the fiftieth anniversary of The Social Function of Science (1990) 1. 3. Gary Werskey's study of five left scientists had similar problems in that only Joseph Needham was willing to be interviewed. G. Werskey, The Visible College, London, Allen Lane, 1978. 4. J. D. Bernal, The World, the Flesh and the Devil, London, Kegan Paul, 1929. 5. Margaret Gardiner, "Moscow Winter 1934," New Left Review 98,July/August 1976. 6. Thus when in the 1990s the ICA sought to sell Bernal's gift of the mural Picasso had sketched on Bernal's apartment wall at the time of the aborted London 1950 peace conference, only Michael, as Eileen's elder son, was consulted. 8. Dorothy Hodgkin was probably the single exception, but she was very clear about the dangers of a woman being married to someone in the same field (interview April 1991). 9. Anne Sayre, Rosalind Franklin and DNA: A Vivid View of What It Is Like to Be a Gifted Woman in an Especially Male Profession, New York: Norton, 1975. 10. This does not mean that rampant sexism was not present in the Birkbeck laboratory environment. In the early seventies while waiting for a meeting to start, one of Bernal's close colleagues showed a group of radical science activists some pornographic photographs. The evident embarrassment of the group persuaded him to put them away. As the one woman present acutely recall my feelings of rage and humiliation. - HR. 11. Sharon Traweek's 1989 anthropological study of physicists (Beamtimes and Life Times: The World of High Energy Physics, Cambridge MA: Harvard University Press) meticuiously documents this compulsory heterosexuality for men physicists and a sort of androgenous sexuality for women. 12. His PhD student, the immensely distinguished crystaliographer Dorothy Hodgkin FRS, OM, described her feeling when she learned that she had been awarded the Nobel Prize: intense pleasure at the honour modified by sadness as she felt it should have been shared with Bernal. Interview, April 1991. 13. Tor Wennerberg (1997), in an otherwise excellent piece on the recent eugenic "scandal" in Sweden, mistakenly seeks to recruit Bernal's hatred of unreason into today's language of antiracism. He misreads Edwin Roberts, The Anglomarxists, New York, 1996. See p. 146 where Roberts describes Bernal's passionate commitment to reason and his hatred of irrationalism. See Tor Wennerberg, "Nazism, Sterilisation and Propaganda," New Left Review 226, pp. 146-54. 14. The Marxist geneticist Herman Muller, working in the USSR in the early years of the Revolution, was an outstanding supporter of socialist eugenics. His science fiction speculations echoed his deeply androcentric dreams, cloning lots of Lenins, Einsteins, and other important men in science and left politics. Among the biologist leftists speculating on the future of reproduction, only the geneticist J. B. S. Haldane — with a feminist sister, Naomi Mitchison, and married to a feminist, Charlotte Haldane — thought of cloning women as well. 15. Nils Roll-Hansen, Gunnar Broberg, and Mattias Tydén, Eugenics and the Welfare State: Sterilization Policy in Norway, Sweden, Denmark and Finland, East Lansing, Michigan, 1996. 16. Nils Roll-Hansen, "The Practice Criterion and the Rise of Lysenkoism', Science Studies, 1, 1989, pp. 3—16. 17. Jonathan Freedland, "Master Race of the Left," Guardian, 30 August 1997. 18. For all his eminence in scientific circles, Bernal was entirely capable of taking part in direct confrontation. The story of his going to an antifascist demonstration with half a brick in his pocket told to HR by a local Camden Communist Party militant was part of that. While I am in no position to judge the veracity of the story it does tell us how Professor Bernal FRS was seen by his fellow militants. - HR. 19. While this is very evident retrospectively, at the time only the Marxist historian Benjamin Farrington understood this particular British development. 20. Feminist critics of science have long pointed out that this apparently democratic and universal "any man" was historically restricted to men of a certain class. See also Steven Shapin, A Social History of Truth, Civility and Science in Seventeenth-century England London, Chicago, Chicago University Press, 1994. 21. Bernal's utopian view of science as necessarily Communist and democratic found echo in an immensely influential text by the pioneering sociologist of science Robert K. Merton, "The Normative Structure of Science" Chicago: Chicago University Press (1973). Between the first publication of the paper — pre Cold War — and later versions, the political Merton changed a key norm, which had initially echoed Bernal, from "Communism" to "Community." 22. Bernal might well have been pleased, however, that the sociologist and critic of science Dorothy Nelkin was a recent recipient. 23. The English Bernalist Alexander King pioneered the growth of science policy studies at the OECD. 24. See Michael Gibbons et al., The New Production of Knowledge: The Dynamics of Science and Research in Contemporary Societies, London, Sage, 1994. 25. J. D. Bernal, "The Struggle with Death," New Scientist 12 January 1967, pp. 86-8. 26. B. Farrington, transcript, BBC interview with G. Werskey, "A Generation for Progress," broadcast 27 September 1972. 27. P. G. Werskey (1975) "Making Socialists of Scientists: Whose Side is History on?" Radical Science Journal, 2/3 pp. 13-50; "the CPGB was able to formulate the ideological and organisational basis of the radical intelligentsia's politics in the 1930s. . . . the Party encouraged its bourgeois members and "fellow-travellers” to concentrate their energies on organising and writing for their own political subgroups. With the intelligentsia so divided, the Party's officials could then rationalise their total control ... This rationale for a privileged elite within the vanguard was already quite familiar to Soviet intellectuals' (pp. 30-31). 28. J. D. Bernal, “The Scientist and the World Today: The End of a Political Delusion," Cambridge Left, Winter 1933-34, pp. 36-45. 29. J. D. Bernal, "Albert Einstein: An Appreciation," Labour Monthly, 37(6), 1955, pp. 268-73; "Picasso 80th Birthday Tribute,: La Nouvelle Critique, Paris, 23 November 1961. 30. P. Anderson, "Components of the National Culture," New Left Review, 50, 1968, pp. 3-57. 31. For accounts of the AScW see Werskey, "Making Socialists of Scientists"; H. Rose and S. Rose, Science and Society, London, Allen Lane, 1969; R. Macleod and K. Macleod, "The Contradictions of Professionalism: Scientists, Trade Unionism and the First World War," Soc. Stud, Sci. 9, 1979, pp. 1-32. 32. See W. K. G. Armitage, Sir Richard Gregory, His Life and Work, London, Macmillan, 1957; also Werskey "Making Socialists of Scientists." 33. Bernal organized the first conference on academic freedom in Oxford in 1935. 34. CSAWG, The Protection of the Public from Aerial Attack, London, Gollancz, 1937. The science writer Ritchie Calder, who took part in this campaign, has described how, to make the demonstration of the inadequacies of the gas masks more apparent to their audiences, the wearer was instructed to smoke a cigarette inside the mask; the smoke would appear on the outside. To ensure that the demonstration was theatrically effective, they removed the filters from the masks! 35. The physicist Eric Burhop, later to work on the A-bomb, later still to become president of the WFSW (as well as an FRS), was a postgraduate student member of CSAWG; Wilkins was also a student member of CSAWG, involved in the gas protection experiments. He became the president of the British Society for Social Responsibility in Science in 1969, and continued in this role for the lifetime of the organization. 36. "A group of economists, scientists and technicians," Britain without Capitalists: A Study of What Industry in a Socialist Britain Could Achieve, London, Lawrence and Wishart, 1936. See "Science and Education," pp. 407-68. 37. B. Hessen, in Science at the Crossroads (no editors) London, 1931; Kniga, pp. 149-212. 38. Joseph Needham describes this in his foreword to a new edition of Science at the Crossroads, 1971, London, Cass, 1971. 39. See M. Prenant, Biologie et Marxisme, Paris, Editions Société Internationale, 1935; H. Levy, The University of Science, London, Watts, 1932; and A Philosophy for Modern Man, London, Watts, 1938; J. B. S. Haldane, The Marxist Philosophy and the Sciences, London, Allen and Unwin, 1938. Lancelot Hogben, the social biologist, loathed dialectical materialism while endorsing historical materialism, and refused to join the CPGB until it embraced British empiricism. 40. J. D. Bernal, "Dialectical Materialism', in Aspects of Dialectical Materialism, London, Watts, 1934, pp. 89-122. 41. See text 2(1), Science and Society, Winter 1937, pp. 58-66. 43. Our own ambivalent relationship with the Bernalian tradition during the 1960s in, for example, Science and Society is neatly captured by Ravetz. He writes, "it is interesting that throughout their historical study, the authors of the (latter) book show impatience with the slow growth of the industrialisation (of science); but in the final chapter they find themselves making a radical criticism of the state of affairs that has finally been achieved." J. Ravetz (1971) Scientific Knowlege and its Social Problems, Oxford: Clarendon Press, 1971. 44. J. D. Bernal, "Professor Bernal Replies," New Statesman and Nation, 18, 441, 5 August 1939, pp. 210-11. 45. D. Noble, America by Design, Cambridge, MA, MIT Press, 1979. 46. J. R. Baker, "Counterblast to Bernalism," New Statesman and Nation, 18, 440, 29 July 1939, pp. 174-5. 47. Quote by an unnamed researcher, believed to be Baker, in S. Zuckerman, Science at War, Flondon: Hamish Hamilton, 1966. 49. See W. McGucken, "On Freedom and Planning in Science: the Society for Freedom in Science, 1940-1946," Isis, 1979. 50. There is a huge and often repetitive literature here which we do not cite. 51. There was of course no problem for the secret revolutionaries, the spies Burgess, Maclean, Philby, and Blunt. 52. The Royal Society has not, since the 1939-45 war, admitted publicly engaged leftists to membership — unlike the National Academy of Science in the US — and perhaps we should not expect it to. 53. T. D. Lysenko, Soviet Biology, a Report to the Lenin Academy of Agricultural Sciences, Moscow, 1948; London, Birch Books. 54. As president of the Lenin Academy of Agricultural Science, Vavilov tried to recruit Lysenko but was blocked by senior plant physiologists who found him uneducated and unwilling to learn. Despite the debate between historians concerning the later relationship between the two men, Vavilov began as Lysenko's patron. N. Roll-Hansen, (1989) “The practice criterion and the rise of Lysenkoism," Science Studies, 2, 1989, pp. 3—16. 55. R. Levins and R. C. Lewontin, The Problem of Lysenkoism, in H. Rose and S. Rose (eds. ), The Radicalisation of Science, London: Macmillan, 1976, pp. 32-64. 56. L. R. Graham, Science and Philosophy in the Soviet Union, New York, Knopf, 1972; D. Joravsky, Soviet Marxism and Natural Science, London, 1961: Routledge and Kegan Paul; D. Lecourt, Proletarian Science? The Case of Lysenko, London: New Left Books, 1977; Z. A. Medvedev, The Rise and Fall of T. D. Lysenko, New York, Columbia University Press, 1969; Roll-Hansen; A. Vucinich, “Soviet Physicists and Philosophers in the 1930s: Dynamics of a Conflict," Isis, 71, 1980, pp. 236-50. 57. For responses in Britain see J. Huxley, Soviet Genetics and World Science, London: Chatto and Windus, 1949; F. Ashby, A Scientist in Russia, London; Penguin, 1947; J. Langdon-Davies, Russia Puts the Clock Back, London: Gollancz, 1949; M. Polanyi, "The Autonomy of Science," Science Monthly, 60, 1945, pp. 1410-50; C. D. Darlington, "Retreat from Science in Soviet Russia," The Nineteenth Century and After, 142, 1947, pp. 157-68 and Society for Freedom in Science, Papers on the Soviet Genetics Controversy, occasional pamphlets 9 and 10 (1949 and 1950). For later reflections see G. Jones, "British Scientists, Lysenko and the Cold War," Economy and Society, 8, 1979, pp. 26-58; for France see Lecourt. 58. This and the following contributions of Levy and Bernal are to be found in the Proceedings of the Engels Society, nos 1, 2 and 3 (1949) and 7 (1952). Bernal’s contribution is published as "Biological Controversy in the Soviet Union," Modern Ouarterly, 4, pp. 203-17. 59. J. B. S. Haldane, Proc. Engels Soc. 1, 1949, pp. 8-9. 60. R. W. Clark, J. B. S. The Life and Work of J. B. S. Haldane, London, Hodder and Stoughton; 1968. 61. H. Levy, Proc. Engels Soc., 1949, pp. 7-8. 62. J. D. Bernal, Proc, Engels Soc., 1, 1949, pp. 11-12. 63. There is a vast literature here, but in its sharpest form the conflict can be seen between the gene-based writing of Richard Dawkins and the more organismic, process-based position of Steven Rose. See R. Dawkins, The Selfish Gene, Oxford, Oxford University Press, 1976; S. Rose, Lifelines, London, Allen Lane, 1997. 64. J. D. Bernal, Science in History, first, second, third editions (1954, 1957, 1965); London: Watts. 65. J. D. Bernal, "Stalin as a Scientist." Modern Quarterly, 8, 1953, pp. 133-42. 66. J. D. Bernal, "The Materialist Theory of Life: a Review of The Double Helix by James Watson," Labour Monthly, 50, 7, 1968, pp. 323-6. 67. See H. Rose and S. Rose (eds.) (1976) Ideology of and in the Natural Sciences (2 vols) London, Macmillan; R. M. Young (1977) "Science Is Social Relations," Radical Science Journal, 5, pp. 65-131; H. Rose and S. Rose (1979) “Radical Science and its Enemies," in R. Miliband and J. Saville, eds., Socialist Register, London: Merlin, pp. 317-35; and the special issue of Science Bulletin (The CPGB's science discussion journal) 22, 1979. 68. See for example M. Millionshchikov, in The Scientific and Technological Revolution: Social Effects and Prospects, Moscow, Progress Publishers, 1972, pp. 13-38. 69. See E. Mandel, Late Capitalism, London, New Left Books, 1975. 70. J. D. Bernal, "After Twenty-five Years" in M. Goldsmith and A. Mackay, The Science of Science, London, Penguin, 1964; H. Marcuse, One Dimensional Man, London, Routledge and Kegan Paul, 1964; J. Habermas, Towards a Rational Society, London: Heinemaann, 1971. 71. Rose and Rose, Science and Society. 72. D. J. de Solla Price Little Science Big Science, New York, Columbia University Press,1963. 73. This foundation was conspicuous for the number of industrialists and the shortage of science critics amongst its members. 74. J. D. Bernal, Marx and Science.